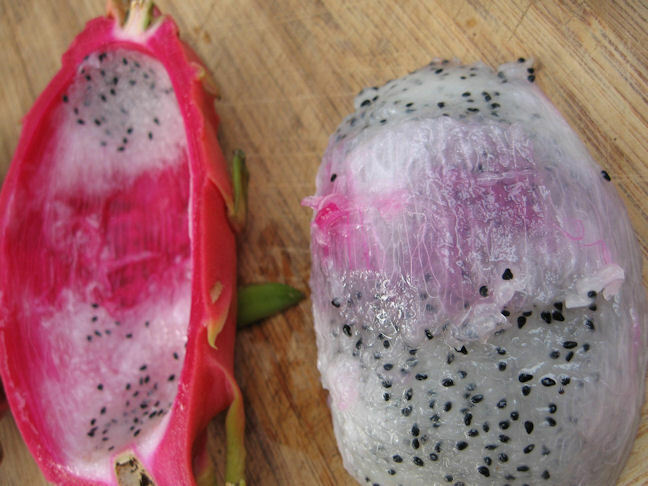 Foodalution: The taming of the... Dragon Fruit! The taming of the... Dragon Fruit! Step 1) Head to your library and pick up a copy of a fantastic book titled the exotic fruit and vegetable handbook by Oona van den Berg. Read before bed, and you will dream of dragon fruits, sapodillas, palm fruit and cherimoyas. Step 3) Prepare your work area, you will need 1 large knife and 1 spoon. Step 4) Get ready for some amazing visual contrast. It was like cutting into a dinosaur egg... and then finding 101 Dalmatians inside! See for yourself. Step 5) Scoop! Take your spoon and gently scoop the dragon flesh out, if you are careful, you can scoop it all out in one fell swoop making it even more lovely for the presentation. 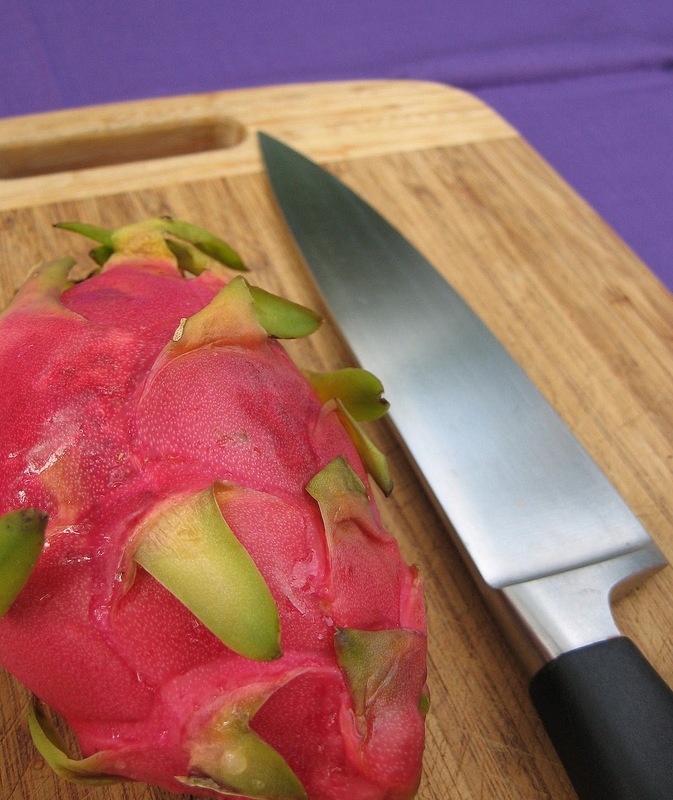 Step 6) Cube the dragon fruit carefully and transfer back into the shell of the fruit. Enjoy alone or drizzle lemon syrup over the fruit for added flavor. I really did start dreaming about exotic fruits after I poured over that wonderful book one evening while curled up on my couch. One of our local Asian Food Markets carries lots of fun produce, so I headed over last week to see what fruits I could pick up and bring home to taste. I ended up with lychee, dragon fruit, and rambutan. It felt like I needed a lesson in exotic fruits, how to peel them, eat them and what they taste like. Ten dollars later..... they were in my car heading home. The kids took one look at the dragon fruit and their eyes popped open wide with a "what is that?" expression. I even had an "ewww, we're going to eat that." It was like I brought home an undesirable alien. 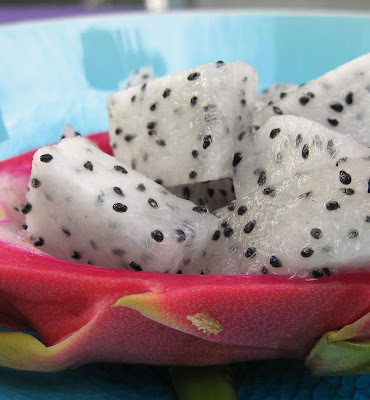 I proceeded to dice the dragon fruit and serve it up to them. I think we were all a bit disappointed when we took our first bite. With all the pomp and circumstance that the fruit comes housed in, we were all expecting some sort of an enticing exotic flavor. Sadly, it was quite bland, extremely mild.... pretty much flavorless ie. BORING. However, not wanting to dis this beautiful glorious dinosaur egg fruit.......it does holds it's shape beautifully and would be a great addition to any mixed fruit salad. Hi Megan, I've done a number of dragon fruit desserts - cheesecake, scones, granita and drink. But I used the red-pink fleshed dragon fruit, which has the same taste as the white-fleshed one, but is even more arresting to look at! 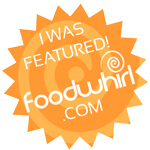 Check out the recipes on my site when you have time. Disappointed to hear it is bland. 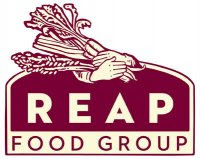 Have been staring at it at the local grocer's (yes, very pricey) and when you keep an Italian blog - you're just not sure how it would fit in. But - you know - it looks positively gorgeous. 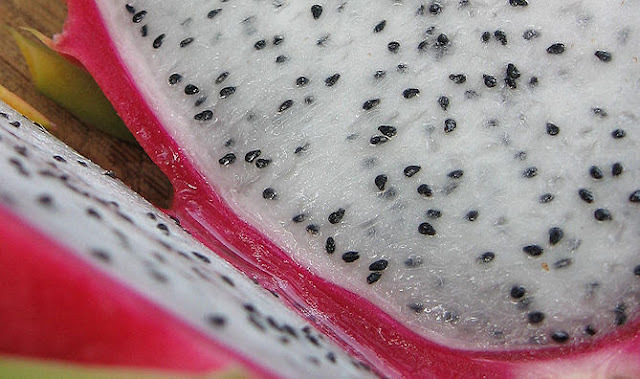 I ogled dragon fruit in the grocery last week but the $9.99 price tag for one of them discouraged me. It really is beautiful though! I think the fascination you have with these fruits are the same as mine with the currants and fruits on your blog. Rambutans thrive here and many just leave them on the tree to rot. I guess people are just lazy to pluck them cos it is so abundant here. I luckily paid around 5$ for the 2 fruits.... which I thought was a bit pricey - however it was no where near the $9.99 price tag of scarambledhenfruit! Wow, really pricey. - Wendy - I do have a fascination with your local fruits! Tis true - it is such a treat to eat rambutans - I have had them before while in Costa Rica and I knew that my kids might like them - I will check out your jelly recipe. Thanks! @ Claudia and Marisa - Wendy states that you can find some sweet white ones. I thought that it may be the case that the ones we purchased were similar to when we buy local fruit here and it's taste is quite mild. It really reminded me of a melon with out much flavor. But again... it was too gorgeous, I did think about throwing into a smoothie.... Something about eating a fruit from a night blooming cactus is just pure dreamy! A very pretty dragon fruit! I also love to get new fruits/veggies to try. I do remember dragon fruit being slightly bland but it paired really well with avocados and shrimp in a crepe. I'll look for it at the market;) Great post by the way. There are so many fruits that people just don't know 'how to tame' (smile). Lovely! You finally found some dragon fruits. Hope you enjoy it. I just made some dragon fruit jam the other day. It was yummy! Btw, if you've any other preservative you can also join in the link, at the bottom of my dragon fruit jam post hosted by Diana & some other members. Have fun! They look so pretty! Perfect to pack them with some flowers, and bonbons, as a fruit basket. Simply eye catching. That dragon fruit is something else. I had heard about it and finally got to see it during my last vacation to Malaysia and Singapore. The price was pretty reasonable over there. Love sapodillas as they are ealy sweet and yummy. I have never seen them here. It's truly beautifl and exotic looking! Love the simplicity of how you served it. That fruit is almost mythical. Congrats on conquering it! Hi Megan, we too just cut into the very same fruit today. Yes it's pretty on the outside, but we also disappointed with the lack of flavor on the inside. Still fun to try though! Nice post! Foodalution ♥ in your in-box! 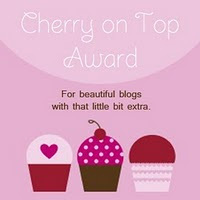 Can I presuade you to follow my blog? put up or shut up ! Blog by Megan Hile. Images by Megan unless noted.. Powered by Blogger.